Happy Monday everybody! 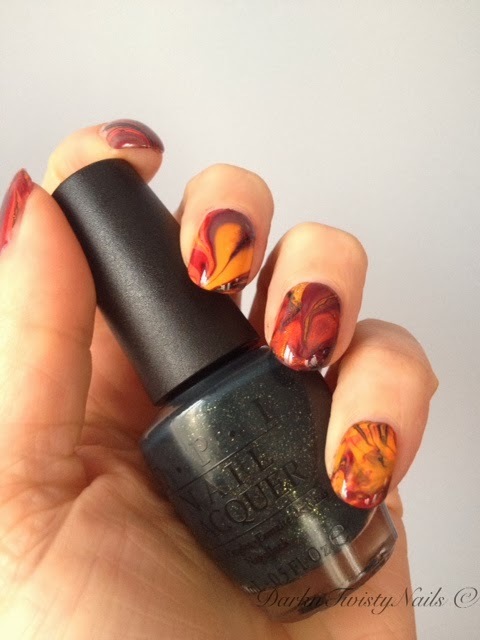 Time for another Mani Monday and today's theme is Fall. 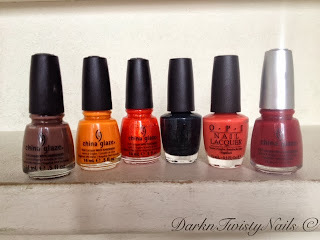 I love the colors for fall, warm and cosy, they always remind me of hot chocolate by the fire. 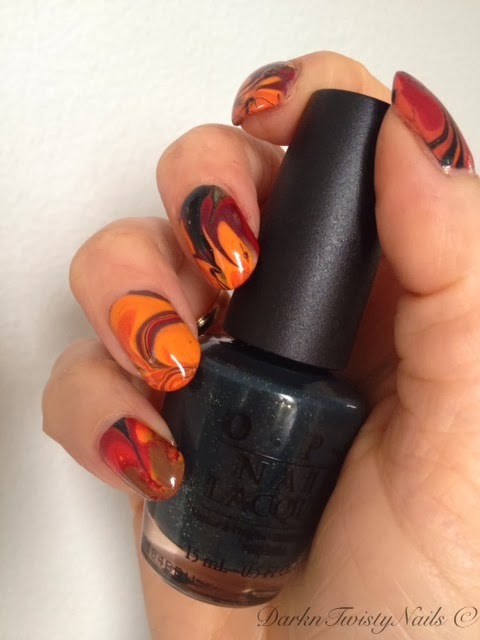 For today's mani I tried something new: Water Marble. I watched a lot of video's on how to best go about this on Youtube and it looked fairly simple and like a fun art I could even pull off. The result was... well... kinda fun actually! I think it's definitely a fall mani, but more like a psychedelic fall storm instead of the gorgeous fall leaves I was going for. 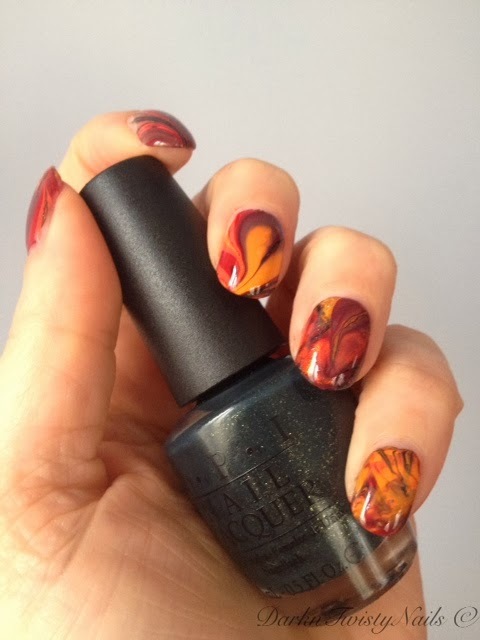 I used quite a few polishes for this look, maybe it would have been a better idea to do my first ever marble with just a couple of polishes, but hey, I thought go big or go home! I really like the combination of these colors, I just need some more practice getting a nice pattern and getting that pattern on my nails. And don't get me started on the clean up... I used lip balm to make clean up easy and it was, but it still took me a long time to get everything off, especially the cuticles were hard to clean. But I did eventually mannage to get it to look halfway decent. I really like the design on my thumb, it's a good representation of how I felt while creating this mani... All over the place! Even though this was one of the most frustrating mani's I've ever done, I really like the result. I will be experimenting with this technique again in the future, but I will definitely use fewer polishes! 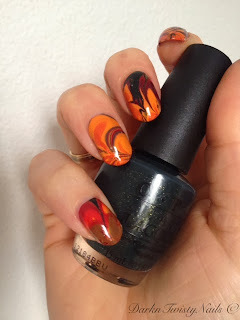 Have any of you ever done a water marble and if so, what are your tips to make it easier? Thanks so much! I'm really bummed that I didn't take a picture of the battlefield I left behind when making this mani, it was epic, lol! So beautifull, are you sure this is the first time? Trust me, if you would have seen my table when I was done, you wouldn't have any doubts this was my first! 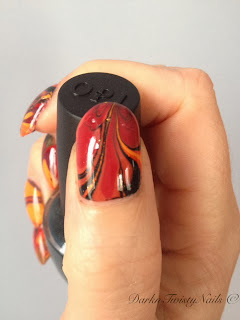 LOL, what a great blog post and I love your water marbling. I believe I ended up throwing something when I attempted to do it...it was not pretty! Thanks! I'm glad I wasn't the only one having problems with marbling. Mysery loves company, lol! So absolutely beautiful!! You did awesome! My first and only water marble was for the nail challenge on Instagram and though it did turn out decent I didnt have a great design or anything...I ended up just doing swirling and it kinda looked tye dyed. This is inspiring me to try another attempt! I saw your marble, the pink, purple, blueish one, right? I thought it was really nice!